Technology provides ample opportunities for the acquisition and processing of physical, mental and social health primitives. However, several challenges remain for researchers as how to define the relationship between reported physical activities, mood and social interaction to define an active lifestyle. 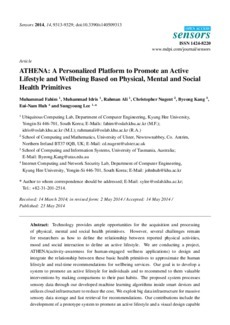 We are conducting a project, ATHENA(activity-awareness for human-engaged wellness applications) to design and integrate the relationship between these basic health primitives to approximate the human lifestyle and real-time recommendations for wellbeing services. Our goal is to develop a system to promote an active lifestyle for individuals and to recommend to them valuable interventions by making comparisons to their past habits. The proposed system processes sensory data through our developed machine learning algorithms inside smart devices and utilizes cloud infrastructure to reduce the cost. We exploit big data infrastructure for massive sensory data storage and fast retrieval for recommendations. Our contributions include the development of a prototype system to promote an active lifestyle and a visual design capable of engaging users in the goal of increasing self-motivation. We believe that our study will impact the design of future ubiquitous wellness applications.